The State of Vietnam (Vietnamese: Quốc gia Việt Nam; French: État du Viêt-Nam) was a state that claimed authority over all of Vietnam during the First Indochina War although part of its territory was actually controlled by the communist Việt Minh. The state was created in 1949 and was internationally recognised in 1950. Former Emperor Bảo Đại was chief of state (Quốc Trưởng). After the 1954 Geneva Agreements, the State of Vietnam had to abandon the northern part of the country to the Democratic Republic of Vietnam (DRV). Ngô Đình Diệm was appointed prime minister that same year and—after having ousted Bảo Đại in 1955—became president of the Republic of Vietnam. Anthem: "Thanh niên Hành Khúc"
Since the August Revolution, the Việt Minh had seized all of the territories of Vietnam. The Democratic Republic of Vietnam was established by the Việt Minh on September 2, 1945 (the same day Japan signed surrender documents with the United States). By February 1947, following the pacification of Tonkin (Northern Vietnam), the Tonkinese capital, Hanoi, and the main traffic axis returned to French control. The Việt Minh partisans were forced to retreat into the jungle and prepared to pursue the war using guerrilla warfare. In order to reduce Việt Minh leader Hồ Chí Minh’s influence over the Vietnamese population, the French authorities in Indochina supported the return to power of the Bảo Đại, the last emperor of the Nguyễn Dynasty), by establishing puppet states, including the State of Vietnam. Bao Dai had voluntarily abdicated on August 25, 1945, after the fall of the short-lived Empire of Vietnam, a puppet state of the Empire of Japan. On June 5, 1948, the Halong Bay Agreements (Accords de la baie d’Along) allowed the creation of a unified Vietnamese government replacing the governments of Tonkin (North Vietnam) and Annam (Middle Vietnam) associated to France within the French Union and the Indochinese Federation then including the neighboring Kingdom of Laos and Kingdom of Cambodia. 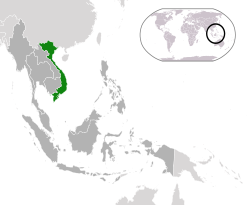 Cochinchina (South Vietnam), however, had a different status, both as a colony and as an autonomous republic, and its reunification with the rest of Vietnam had to be approved by its local assembly, and then by the French National Assembly. During the transitional period, a Provisional Central Government of Vietnam was proclaimed: Nguyễn Văn Xuân, until then head of the Provisional Government of South Vietnam (as Cochinchina had been known since 1947) became its president, while Bảo Đại waited for a complete reunification to take office. However, the Democratic Republic of Vietnam had declared the independence of Vietnam and had control of almost all of Vietnam's territory since September 2, 1945. Besides that, the DRV had also hosted the 1946 Vietnamese National Assembly election with the participation of 89% of Vietnamese voters (north and south). The Democratic Republic of Vietnam had officially become the constitutional representatives of Vietnam in 1946. Since the Halong Bay Agreements resulted in many aspects—excluding the referendum—in the enforcement of the March 6, 1946, Indochinese Independence Convention signed by Communist Hồ Chí Minh's Democratic Republic of Vietnam and High Commissioner of France in Indochina Admiral Thierry d'Argenlieu, representative of Félix Gouin's Provisional French Republic led by the French Section of the Workers' International (SFIO), some regarded the State of Vietnam as a puppet state of the French Fourth Republic. On May 20, 1949, the French National Assembly approved the reunification of Cochinchina with the rest of Vietnam. The decision took effect on June 14 and the State of Vietnam was officially proclaimed on July 2. From 1949 to 1954, after reunification with Cochinchina, the State of Vietnam had partial autonomy from France as an associated state within the French Union. Bảo Đại fought against communist leader Hồ Chí Minh for legitimacy as the legitimate government of Vietnam through the struggle between the Vietnamese National Army and the Việt Minh during the First Indochina War. The State of Vietnam found support in the French Fourth Republic and the United States (1950–1954) while Hồ Chí Minh was backed by the People's Republic of China (since 1950), and to a lesser extent by the Soviet Union. Despite French support, roughly 60% of Vietnamese territory was under Việt Minh control in 1952. After the Geneva Conference of 1954, as well as becoming fully independent with its departure from the French Union, the State of Vietnam became territorially confined to those lands of Vietnam south of the 17th parallel, and as such became commonly known as Republic of Vietnam. The massive voluntary migration of anti-communist north Vietnamese, essentially Roman Catholic people, proceeded during the French-American Operation Passage to Freedom in summer 1954. On May 27, 1948, Nguyễn Văn Xuân, then President of the Republic of Cochin China, became President of the Provisional Central Government of Vietnam (Thủ tướng lâm thời) following the merging of the government of Cochin China and Vietnam in what is sometimes referred as "Pre-Vietnam". On June 14, 1949, Bảo Đại was appointed Chief of State (Quoc Truong) of the State of Vietnam; he was concurrently Prime Minister for a short while (Kiêm nhiệm Thủ tướng). On October 26, 1955, the Republic of Vietnam was established and Ngô Đình Diệm became the first President of the Republic. The State of Vietnam referendum of 1955 determined the future regime of the country. Following the referendum's results the State of Vietnam ceased to exist on October 26, 1955, and was replaced by the Republic of Vietnam—widely known as South Vietnam—whose reformed army, under American "protection", pursued the struggle against communism; the Việt Cộng replaced the Viet Minh, in the Vietnam War. Following the signing of the 1949 Élysée Accords in Paris, Bảo Đại was able to create a National Army for defense purposes. It fought under the State of Vietnam's banner and leadership and was commanded by General Nguyễn Văn Hinh. A 100 piastres sample note of 1954. The currency used within the French Union was the French Indochinese piastre. Notes were issued and managed by the "Issue Institute of the States of Cambodia, Laos and Vietnam" (Institut d’Emission des Etats du Cambodge, du Laos et du Viêt-Nam). ^ "Lễ thoái vị của Hoàng đế Bảo Đại qua lời kể của nhà thơ Huy Cận". VnExpress. Retrieved 2016-09-08. ^ "Vietnam independence proclaimed - Sep 02, 1945". HISTORY.com. Retrieved 2016-09-08.